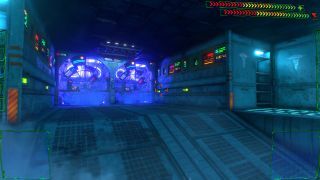 System Shock: Enhanced Edition hit GOG in September and that was cool, but even cooler was the news earlier this month that Night Dive Studios is also working in a full-on remake. Today the studio provided the first look at what it's got cooking to Polygon, which posted a half-dozen then-and-now comparison shots illustrating how the game has changed, plus a few pieces of concept art. The visual effects are obviously way beyond what was possible back in 1994, but the System Shock aesthetic (which is a swanky way of saying "blue") is intact. It's impossible to draw any meaningful conclusions from just a handful of images of a single location, but if this is representative of Night Dive's plans for the entire game, it doesn't appear as though it's going to stray too far from the original level designs. That's not entirely surprising, I suppose, given that Robb Waters, one of the artists and designers on the original System Shock, is helping develop the new one. My one complaint about these pics is that they're just shots of a room, with a couple robots standing around doing nothing. As dynamic screen captures go, this stuff is pretty near the bottom of the barrel. On the other hand, this is System Shock we're talking about, and that's pretty hot stuff its own right.